As fish (or Tasmanians for that matter) go, the Spotted Handfish is definitely unique. Their overgrown pectoral fins eerily resemble human hands, and due to the lack of a swim bladder, they prefer to ‘walk’ on these hands rather than swim across the sea floor. Handfish have been around since dinosaurs roamed the planet and the Spotted variety used to be a common fish, found up and down Tasmania’s east coast. However, a wide-scale survey in 1996 recorded only a small number of individuals at four sites, helping it to become the first marine fish to be listed as critically endangered on the IUCN’s Red List of Threatened Species. The future is starting to look a bit brighter for the Spotted Handfish. 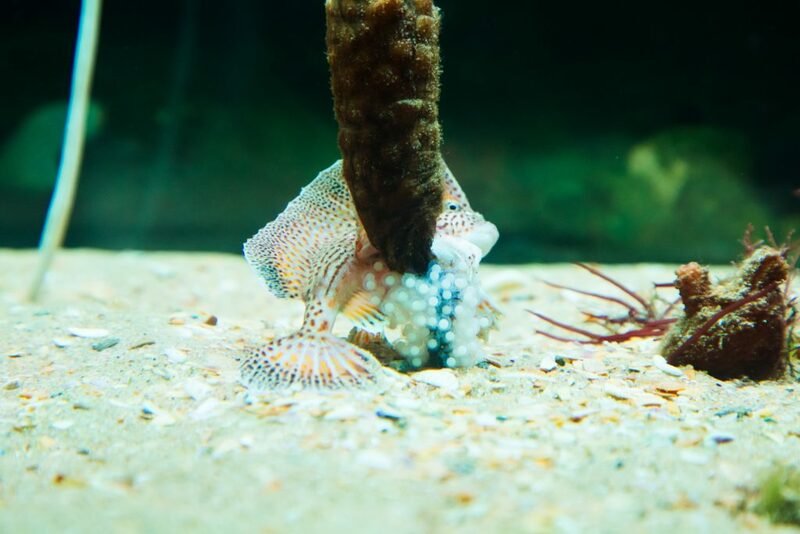 Earlier this month around five hatchlings went on display at Tasmania’s Seahorse World. The hatchlings are the result of a successful captive breeding program we undertook with our research partners. The program began in September, 2017, with the collection of 20 fish from eight sites around Hobart’s Derwent Estuary. Fish were collected by hand and then quickly transported back to our site in Hobart where a welcoming committee were waiting to swiftly transfer the fish into a holding facility. Our custom built facility aimed to replicate the fishes’ preferred environment, with photographs pinned to the tank glass, objects for the fish to hide behind, a programmable light system and artificial stalked ascidians (a type of sea tulip that the fish commonly lay their eggs around). This setup helped to make the fish feel right at home, and quickly proved successful with one pair of fish breeding soon after collection. Following transfer of these brood stock to the SEA LIFE Melbourne Aquarium and Seahorse World another pair bred. 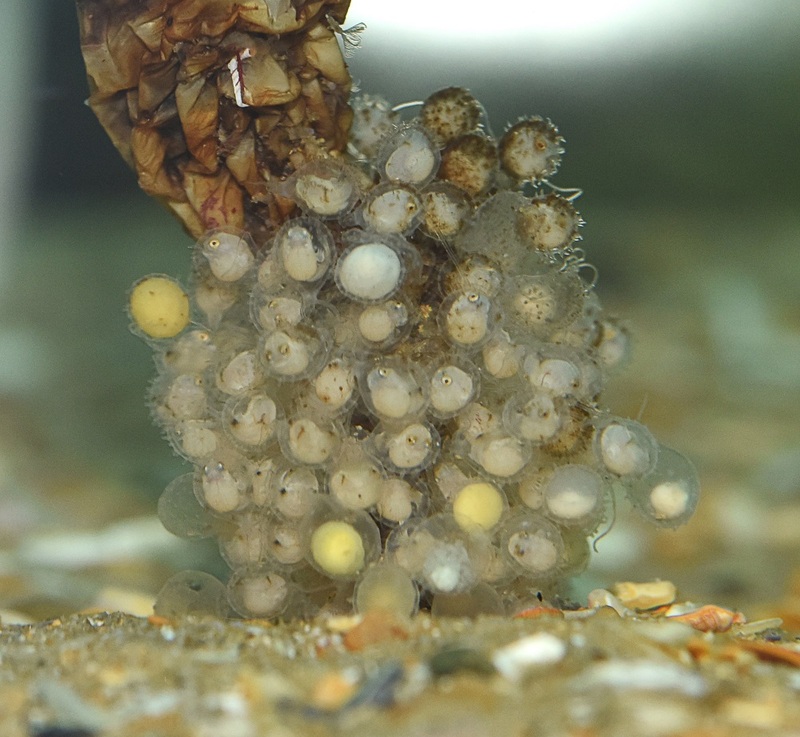 Our babies are born – tiny handfish have hatched at Seahorse World Tasmania. Unlike many fish species, which ‘lay and go’, adult Spotted Handfish remain with their eggs until they hatch, which usually takes around 6 to 10 weeks. This could be to guard their offspring from predators, or clean and provide water flow for the eggs. Once the eggs do hatch, juveniles remain in the general vicinity of their spawning grounds. This means that Handfish are unlikely to recolonise areas from which they have disappeared. Unless, of course, someone lends a helping hand. As soon as the eggs that had been laid at our site began to hatch, 15 juveniles were quickly transported to Seahorse World. The rest were released back into the sea at Battery Point in Hobart, near where the adults had originally been collected. 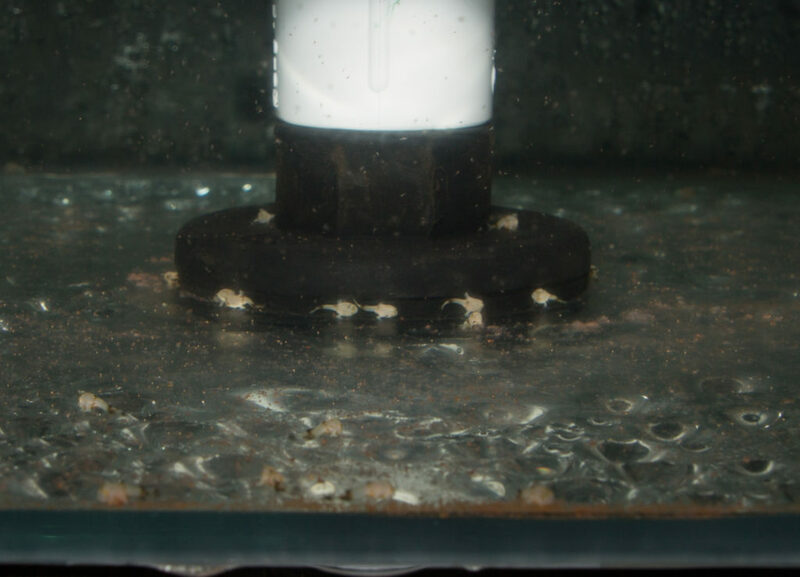 These were later joined by 81 juveniles that hatched at Seahorse World. Our scientists will continue to monitor the Spotted Handfish, both in captivity and in the wild. But hopefully with a continued helping hand these unique Tasmanians will have a bright future. Our research partners for this project are: National Environmental Science Programme’s Marine Biodiversity Hub, Zoo and Aquarium Association, Seahorse World, SEA LIFE Melbourne Aquarium, Derwent Estuary Program, Tasmanian Department of Primary Industries, Parks, Water and Environment, University of Tasmania, and NRM South. Need a hand fishing out more information? Check out what we're doing to help ensure the conservation of Australia’s marine biodiversity. This is a fantastic start to a brilliant captive breeding program. It’s the best hope that the Spotted Handfish has to be saved from the brink of extinct!